All casinos (view the best casino here) need the power of an innovative brain behind them. There are casinos with novel and unique themes, which are assumed never to be surpassed. But in 2017, one such casino made an entry in the market, which has taken the gambling crowd by surprise. 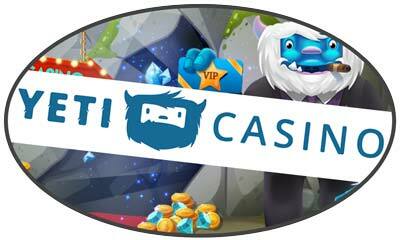 This latest online casino goes by the name of Yeti casino. It is managed by the experienced L & L Europe Ltd., which has a string of established casino brands to its credit like All British Casino, No Bonus Casino, and a few more. Thus, Yeti is in very experienced hands. In addition, it holds legal gaming licenses from 2 of the most respected authorities such as Malta Gaming Authority and the UK Gaming Commission. Who was the snowman Yeti anyway? The casino saw the first light of a day in May 2017. According to mythologies in Nepal, Yeti is an abominable snowman, having a resemblance to a bear and human. Though people fear Yeti, the casino gives you an opportunity to love it. It uses a huge snowman as its mascot and instead of instilling fear and attacking you, it in fact gives you a pleasant reception and attacks you, yes, with good prizes and surprises. 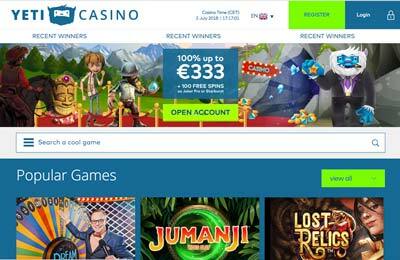 The casino can be accessed by almost all players in European and British countries. The layout of the website is fun, looks cool and attractive. There is a fun-looking beach scene where the huge snowman Yeti is seen relaxing on a hammock, sipping on a juice and playing games on his tablet. Moreover, Yeti casino gives thumbs up for the welcome bonus details. The primary colours used are blue and white. These give a sensation of calmness to the players. Bonuses and Promotions – What is in store for you? Ask any casino goer the reason for which he/she goes to the casino. The immediate answer will be that it is for the bonuses, incentives, promotions, weekly draws, and the excitement that comes along with all these. The Yeti casino bonus is no less. For the newly registered players, they have a very appealing new player bonus. The bonus will be your first with the casino and an equally effective one at that. They usually give a 100% match bonus. The encouraging welcome bonus is given to new players along with a certain number of welcome spins, which can be utilized on the games that are specified by the casino website. All bonus spins are limited to x40 betting requirements (excluding table games, live casino games and video poker). The point of interest here is that no deposit is required for you to claim either the bonus or spins. The bonus offered is considered to be very competitive among other casinos. The bonus also goes hand in hand with a rollover of a certain x times, which lies in the middle range in the casino industry. When you want to convert your bonus earnings to real money, you need to follow the bonus policies laid out by the casino. There are some weekly ongoing bonuses, which take place. As of now, there is a bonus on any one day of the week, which gives a bonus reload of around 25% to all the players depositing money. Some other interesting, additional deals might come up in the future. At present, the offer “Unlimited Cashback” is on Saturdays when you will get a 10% cashback. You need to make a deposit and play as much as you want. If you are winning, great otherwise don’t worry, 10% of all your losses is credited back to your account. Please note that the bonus and its terms of conditions keep changing from time to time, so you have to refer to the latest news from the casino. Yeti has some great software gaming providers behind it. In just about 9 months, the casino has reached the summit. No other proof is needed to know what kind of games this casino supports. All the games are provided through a web-based platform offering instant play. Such facility loads directly via your preferred browser. The Yeti casino games are numbered at around 450+. In addition to the quantity, they provide quality to their players. The games are from the houses of NetEnt, Microgaming, Amatic Industries who provide nothing less than a wholly satisfying gaming experience. You can search for your favourite games by type or the software provider too. Yeti offers a generous serving of the mandatory slots, irresistible jackpots, surprising scratch cards, table turning table games and card games, and live casino too. You would not get over your dose of slots with Game of Thrones, Starburst, Pyramid Quest for Immortality, Break Da Bank, Cool Wolf, Big Panda, Hot Scatter, Jurassic Park, Koi Princess, Thunderstruck, Tomb Raider, Reel Rush, etc. Then you have the much talked about jackpot games. Instead of Yeti hunting for you, there will be role reversal where you will be hunting for its jackpots. Go for Mega Moolah, Arabian Nights, Mega Fortune, Jackpot Deuces, Treasure Nile, Mega Joker, etc. The library for table games is also huge. The casino has included both the high limit and low limit versions of almost all games and you can’t get enough of them. Choose for various versions of Baccarat, Black jack, Roulette, Texas Hold’em, Punto Banco or Poker Pro, Caribbean Stud. The easy to play scratch cards and bingo fill your heart with joy. You can play Big Break, Electro Bingo, Germinator, Samba Bingo, Triangulation, Bunny Boiler Gold, Hexaline and more. Yeti live casino does not disappoint us in any way. They offer live roulette, baccarat, black jack, Caribbean stud, etc. The betting limits are quite flexible, so any kind of player can try his hand at these games. The Yeti casino payment system is robust and solid. If you are using e-wallets, the casino provides immediate payouts, after the 1 day waiting period. Payouts with credit cards are done in 24 hours. When you win, your earnings will be in your hands in no time since Yeti takes 24 hours for the required processing and when your withdrawal request is prior to 6:00 am, it might get processed within a few hours. Yeti customer service is backed by a professional and highly qualified team. The team is available to take your queries at any time during the day or night. They can be reached out via live chat, phone or e-mail. And last but not the least, they have a contact form which you can use to fill out your message, your name and email id. As you submit it, one of the representatives will get back to you at the earliest. Apart from the support agents, a wide range of queries can be cleared through FAQs section on the casino’s website. The questions cover almost everything under the sun regarding the game play, bonus claims and ongoing. A good casino will employ only the most advanced and sophisticated technology to keep its data safe. It makes use of the most trusted SSL encryption method which all reputed sites use. The communication between your computer and the servers of a casino is rendered unreadable by third parties with the use of this encryption. Banking related transactions too are safe. Yeti comes with a fully loaded games lobby, fast and quick bank transfers and clear terms and conditions. There is no reason whatsoever for anyone not willing to try this out. It would be great if more live casino games are included in the games section. Customer support is available 24/7 and is very responsive. Has 2 licences from reputed regulating bodies. Fully compatible with latest smartphones and tablets.